On our last day of our #MakingitPossible stories we spoke to Colleen Kovaluk who lives with ALS. Colleen was diagnosed with ALS in December 2015 and has been attending the Edmonton coffee group with her husband, Peter. "We love coming to the ALS coffee shop because of the great treats they provide. Yummy!" Colleen is known at coffee group for providing a warm welcome to new members with open arms. Colleen's family members are also very active with the ALS community, her sister Melanie who lives in Lethbridge attends the Lethbridge WALK yearly. Her niece Nicole who got married last September made donations to the ALS Society in lieu of party favours at her wedding in Calgary. Colleen and Peter also love spending time with their friendly dog, Kona who is just as warm and pleasant as his owners. Thank you Colleen and Peter for being such a bright presence at each month's coffee group. The Board of Directors of the ALS Society of Alberta is an incredible group of volunteers that generously give their time and expertise to guide our Society and the work we do. They are people that have personally been touched by ALS so they know the depth and intensity of this disease. Tara Pentney, Cathy Martin, Gord Banting, Heather Haddow, Paul Leroux, Dave Williams, Rochelle Maitripala and Nancy Lyzaniwski. They are all #MakingitPossible every day. This year, we would also like to thank and congratulate Jan Desrosiers for an incredible 15 years on our Board. Thank you for all that you have done and the difference you made during your time on the Board. Behind the scenes, they each dedicate countless hours to the work we do, attend numerous events each year and lead our organization with passion and commitment. Thank you to all of you. We are so very lucky. The ALS Society of Alberta is proud to support those affected by PLS and Kennedy's Disease. Today, Corey Kjorsvik is helping to raise awareness about Kennedy's and how he keeps #MakingitPossible to attend support groups in both Calgary and Edmonton. "In 2002 I was diagnosed with Kennedy’s Disease (Spinal Bulbar Muscular Atrophy) at the age of 39. It is a rare genetic neuromuscular disease that affects about 1 in 40,000 people worldwide. It is a slow wasting of the muscle mass with no cure. Going back to 1997, I was feeling signs of weakness in my arms and trouble walking long distances. A couple really bad choking fits made me realize that something was not right and that I needed to see a doctor about it. It has been misdiagnosed in the past as ALS, and I can still remember vividly the thoughts going through my head at the time I was being tested, and what my future would hold. As my symptoms progress the ALS Society has become such a blessing to me. They have taken me under their wings and given me so much support. I have always had the love and support from my family and friends but was never able to find that outlet where I could communicate and share freely with others the same issues, symptoms, feelings that I was going through. It was while attending the ALS clinic in Calgary’s SHC for the first time that made me aware of the fact that I was being surrounded by so much support, and that I needed to stay involved. Now as I move forward, I attend their monthly support group meetings in both Calgary and Edmonton. I look so forward to these meetings. The atmosphere is that of understanding, support, and caring, in such a positive environment. Being able to share with others my own personal knowledge and obstacles and understanding their own, I believe helps to better all of us in moving forward. The ALS Societies lending program has also been so helpful in helping me overcome the obstacles I encounter with mobility. I have now completed my second annual Betty’s Run for ALS in Calgary and am overwhelmed by the outpouring of people that attend in support of their loved ones and friends. Our team The “Kennedy’s Clan was able to raise over $1100.00 this year. Being able to reach out and tell your story, I believe is so important in getting the word out about ALS and looking for that cure. Research I understand through the ALS Society is really progressing right now and hopefully in the process, they will stumble upon and find a cure for Kennedy’s Disease. To everyone that suffers from this terrible disease of ALS, and to those that work and volunteer tirelessly in support of the ALS Society, I say to you all that for who you are and what you do, 'you do truly make a difference in everyone’s life'"
Today we are celebrating John Tuckwell and his Tuckwell’s Travellers Team in the Edmonton WALK for ALS. John’s family is incredible committed to #MakingitPossible to attend the WALK each year, and do an exceptional job fundraising. In 2016, the Tuckwell Travellers were the first-ever recipient of the James H. Brown Edmonton WALK for ALS Team Challenge, raising $46,495! John’s sister, Cathy, travels from Toronto to attend the WALK, and his parents, Linda and Paul travel from BC. 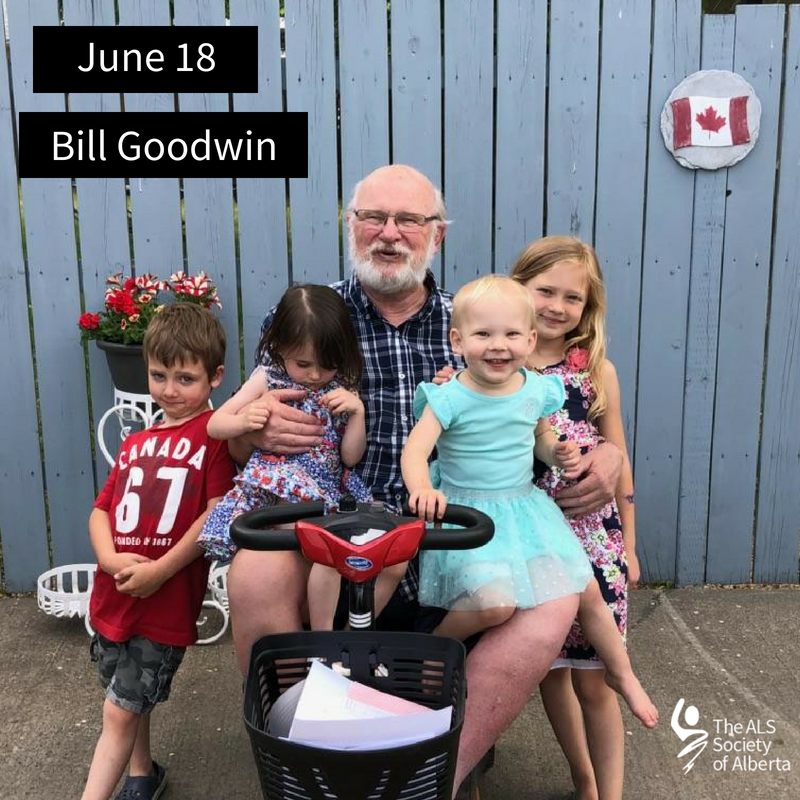 On day 26 of ALS Awarness Month, we wanted to honour Fred Gillis who lived with ALS and was our Edmonton WALK Ambassador in 2017. Fred's wife, Lana wanted to share a few words about Fred and his #MakingItPossible story. "Fred's commitment was passionate and strong, he was all about finding a cure, he knew it was too late for him, but didn't want it to be too late for others. Fred was still able to participate in research trials, even though we moved to another province. He was all in, and didn't want ALS to win...and in his mind he won!" Team Gillis made it to the top 10 fundraisers in Ontario and family members supported his team in our Edmonton Walk. Lana continues to stay connected to the ALS Society. "Everyone is so supportive of each other, this never ends and will always be the way it is. Death ends a life, but not a relationship. I only have two words to describe the ALS Society, love and support." Thank you Lana, for sharing with us. Today we wanted to highlight some of our amazing volunteers for day 25 of ALS Awareness Month. Marcie & Melanie Pruden and Nicole Tymchak coordinated the first ever Drayton Valley WALK on June 16 and it raised over $20,000! Thank you ladies for #MakingItPossible for our clients and everyone who has been affected with ALS. "We were introduced to the ALS Society of Alberta in January of 2015 when our mom, Audrey Pruden, was first diagnosed with ALS. We had no idea what ALS was or what to expect with it, let alone that there was a Society and what it did for people. We soon learned firsthand what the support of the ALS Society was all about! At Mom’s second appointment we were given a transfer wheelchair, through the ALS Society’s Equipment Loan Program, just in case we went somewhere with a lot of walking and Mom got tired. By our third appointment, just 3 short months later, we were dependent on that chair for any length of walking. Once everyday tasks started to become a struggle for Mom, and a struggle for us trying to help her, the Society stepped in and supplied us with whatever we needed to make it possible for Mom to comfortably continue to do what she loved. At the drop of a hat, the Society had whatever equipment we needed on our door step and made sure Mom was happy and comfortable with it. Without the ALS Society we know that we would not have been able to have Mom at home for nearly as long as we did, which was where she wanted to be for as long as possible. We honestly don’t know how we would have made it possible for Mom to have all of the amazing days that she did without the physical and emotional support from the ALS Society. We first heard about The WALKs for ALS in the summer of 2015 and talked about attending one with Mom. We fortunately were busy living as much life as we could live with her that summer and missed the opportunity. We lost our mom in April 2016. Walking in her honour, we attended the Edmonton WALK for ALS in 2017. It was then that we decided we needed to bring this WALK to our hometown of Drayton Valley to help spread awareness for the horrible disease and build a support system in our community for anyone living with and affected by ALS. The three of us (Melanie and Marcie Pruden and Nicole Tymchak, best friend of Marcie’s for over 20 years and known as the third daughter) attended a WALK training session in October 2017, and then we were on our way. Being only 29 – 31 years old, the three of us have taken on something that most people our age would not. However, we are doing this to honour Audrey’s legacy and to help raise funds for the ALS Society and ALS research so that both can continue doing the amazing things they do. This is how we can give back to the ALS Society of Alberta to express our eternal gratitude to them. We held our first annual WALK in Drayton Valley on June 16, 2018 and we look forward to organizing the event for many years to come." On day 22 of ALS Awareness Month, we talked to Lori Rock whose husband, Bob Rock lived with ALS. Lori shares Bob's #MakingItPossiblestory. "I can recall the day, September 29, 2014 - almost to the minute - that Bob was diagnosed with ALS. In fact, he wasn’t even in the room when the doctor (neurologist) said to me, “this is bad, this is very, very bad”…this, after a quick handshake and checking Bob’s hands. After a brief check-up of Bob’s limbs, he came back to the room and said, “your husband has ALS”. The world stopped, and my heart shattered…and Bob didn’t even know yet. In hindsight I would say we were perhaps one of the “lucky” ones, if there is such a thing when it comes to this disease. A very astute chiropractor recognized the symptoms when Bob went to see her because he was having trouble with his hands…she quickly eliminated any back issues and sent a letter to our family doctor who had a neurologist appointment booked for us immediately. Chiropractor, MRI, CT Scan to neurologist and diagnosis within just over a month. When I say we were lucky, it is because we knew so quickly the nature of the beast we were dealing with, without months or even years of visits to various doctors before the diagnosis could be made. When asked one time if he was angry about getting the disease, his quick response was “Nope - what good would that do? Anger takes energy, and I have no energy to waste”. There were lots of emotions, but anger wasn’t one that was allowed in. He was onto count his blessings, and look for the good, 1/2 full glass, rather than 1/2 empty! Bob was a strong man, and although ALS eventually robbed him of the many things he loved to do - golf, horseback riding, even putzing in his shop, he faced each day with a smile and participated in these activities until he absolutely could not...even getting onto his scooter and heading to the shop when he was supposed to be resting! His strength kept us all strong - our two kids and their spouses, and our four beautiful grandchildren. As his breathing worsened, his speech worsened and his limbs deteriorated, they were the light on some very dark days. Never one to wallow, Bob took the news and faced the disease head on, with no false expectations or false hope. His life motto was you had to play the hand you’re dealt…and wow, what a hand. But our life went on, only now with a certainty looming ahead, not just a someday. Again, perhaps we were a little lucky because we were able to make plans for the future. And plan we did – he picked his final songs and readings and knew exactly who was going to do what at his final celebration. But there was much to do before that day came, and all were made easier or in some cases, possible, due to the generosity of the ALS Society – a family trip to Hawaii, family reunions, two full winter seasons in Arizona and much time spent with our family and large extended family who tend to rally at any occasion, but most especially in a time of need. We had ramps built, toilets changed out, trees chopped, out-buildings sided, lawns mowed, flowerbeds tended, meals prepared, windows cleaned, horses and fences looked after, quiet moments of visiting and reminiscing, snuggling a baby…there was something for everyone. The ALS Society…what can I say – they were one step ahead of us all the way, anticipating our needs and providing any type of equipment or gadget we might possibly need – bi-pap, lift chair, bath lift, stair lift…the list goes on. We will be forever indebted to them for their generosity and the quiet and gentle support they provided us. Even the ALS Society of Arizona was kind enough to help us out during the winter months. The disease knows no borders, and thus the societies seemingly have no borders! As Bob's legacy lives on his memory will be kept alive and we will continue to help the society in anyway we can. In Bob's memory, we've held two memorial golf tournaments in Arizona, with number three in the works and all proceeds are donated to the ALS Society; a beautiful niece and her husband turned the traditional "bride and groom kiss" into an ALS fundraiser; and family members continue to participate in ALS walks in Barrhead, Edmonton and Kamloops , proudly sporting Bob's Boys, Beauties and Babes t-shirts. Our prayer, at the onset, was that Bob's good days be many, and his bad days be few. In many ways this prayer was answered due so much to the support we received from the ALS Society, and the love and support of family and friends. Our prayer now is that a cure will be found for this beast - ALS. Sadly, we have indeed learned, 'the last good-bye is the hardest one to say'." Thank you Lori, for sharing this beautiful story. Today we wanted to highlight one of our Coffee Support Groups that are #MakingItPossible on day 21 of ALS Awareness Month. These support groups are offered to those living with ALS, their family members and caregivers. They are offered in casual group settings that provide everyone an opportunity to share their experiences, information and support. Al: "I've met some wonderful people and I've learned more about the disease, I enjoy the outings and friendships!" Carol: "ALS is a terrible scary disease. However, I feel I was blessed when Gayle came over and introduced me to the ALS Society. Everyone there is so understanding, considerate and helpful. Meeting others at the coffee group is a learning experience and meeting all these wonderful people is a privilege. So many positive conversations, so much support, and I feel I have entered a different stage of my life." Bill: "Getting out meeting with people with the same problems is great by learning new things and sharing information." Danny: "All feel like a family before I even met them. A good solid foundation for support." Belle: "I like being able to talk to people like me, and people who understand me. It’s a nice feeling." Marjorie: "Very encouraging when I attend the coffee group, everyone is so pleasant and willing to share. It makes me feel like I am not alone. " Thank you everyone for sharing your thoughts and experiences with us! On day 20 of ALS Awareness Month, George Desmarais wanted to say a few words about his experience with the ALS Society. "I appreciate the compassion and empathy that I have received, even though I wish I didn't need it. The visits with Gayle have brightened my days and all the help the society has given me I'm very thankful for. Hopefully a cure will soon be found. All the best to everyone who suffers with this disease." Thank you, George for sharing your #MakingItPossible story with us! Today Cheryl Ward shares her #MakingItPossible story on day 19 of ALS Awareness Month. "I received a diagnosis Mar 7, 2017 for some speech and swallowing issues I’d been having and it wasn’t a good one; ALS (Amyotrophic Lateral Sclerosis to be exact). Doesn’t that just take the wind out of the sails? It was kind of a nasty outcome but it is what it is. At least now I knew and could deal with it. The day after the diagnosis, I met with the whole ALS Clinic Team. Everything is all together at the South Calgary Campus. I attend a clinic every 3 to 4 months. I call it one stop shopping. It makes it so much easier. There was lots to learn about this disease, that’s for sure. From December to May, I was privileged to take part in Dr. Korngut’s Pimizide double blind study. Hopefully, people facing this diagnosis will benefit soon from whatever results the study unfolds. I am now working with the ACETS people to personalize a communication hub for digitized speech and to retain the ability to use computers. My sister and brother-in-law have been great. I couldn’t get through this without them. My next door neighbours are terrific and friends and family are very supportive. It’s been a year now living with this disease. I can still do most everything, just slower, and most of it is thanks to the help and support of the wonderful people from the ALS Society. From special kitchen tools to walkers and manual and electric wheelchairs, they have made it possible to continue living my life with a great deal of independence. They provide a listening ear and a compassionate heart whenever it is asked for. The ALS Society is needed to help us walk this incredibly complex journey with patients and families. Please do whatever you can to let this support continue." Thank you Cheryl, for sharing your experience with us. On day 18 of ALS Awareness Month, Bill Goodwin is sharing his #MakingItPossible story with us. "I was diagnosed with Motor Neuron Disease (MND) in 2014 and after a 3 year period of testing I got the official diagnosis of ALS in 2017. I started noticing problems in 2013 trying to step up on the curb and my leg just wouldn’t do it. I found myself stopping on the sidewalk to let people go by. I couldn’t balance or bend down and get back up again. I talk to my leg to try to get it to move, but it just doesn’t listen! Because my leg doesn’t listen I lost my ability to go from gas pedal to break and gave up my drivers license. The scooter supplied to me from the ALS Society allows me the freedom to get out and about and socialize with friends and neighbours, as I often do my half hour loop around the neighbourhood and it’s pet friendly too! Being able to socialize and get out and about is very important to me. My family and grandkids are transitioning along with me; from seeing me go from a cane, to a walker to a wheelchair. I don’t want them to feel like they need to stay away from me. I’m still Papa and they accept the way I am, and know I’m not going to rub off on them, or it’s something they can catch or get sick from. I wanted them to know they don’t have to be afraid, I’m still the same person, just things are slower. My son in law was scheduled to work the day of the Walk for ALS. His employer said “No” the Walk is more important and my son in law was there to support my team! That meant a lot to me. I am always doing something family wise and had a nice time with all celebrating my Birthday! We are thankful for the Society and everything they have supplied, but more importantly all the kind, supportive wonderful staff that are all Angels!" Today we are sharing Jim Christianson's story on day 15 of ALS Awareness Month. "After constant MRI's and feeling very tired, I found the right doctor in 2009 where my new journey began living with ALS. I am affected by physical symptoms, but strong emotions and frustration are also a big part of my journey. I feel very inspired by other people at our monthly coffee group. It is important for me to get out and connect with other people, even though we are all different we are all on the same page. A few hundred pounds are lifted off your shoulders because you realize you are not alone and can relate to one another. I love joking around, smiling and making other people smile. This means a lot to me. I know this is hard on my whole family and they are all very supportive and I feel very lucky to have them in my life, as well as my precious pup Sassy!" Jim loved his job working at the Fire Department for 10 years and later becoming a Press-Technician. "I miss working so much, but feel truly blessed my friends from work still come over." Even though it's harder for Jim to do the things he once could do with ease, he continues to make a difference in this community of Barrhead. Just recently he donated his time and talent to his senior community by taking professional pictures of 17 individuals who celebrated their 90th Birthdays in June! "I enjoy helping others through my love of photography." "I truly appreciate the equipment I have received to meet my needs and all the support given to me and my family through the ALS Society. They are awesome." Jim also donated a print (a picture he took of a Cedar Waxwing) for our raffle table at the Edmonton WALK for ALS! Thank you, Jim for sharing your #MakingItPossible story with us! 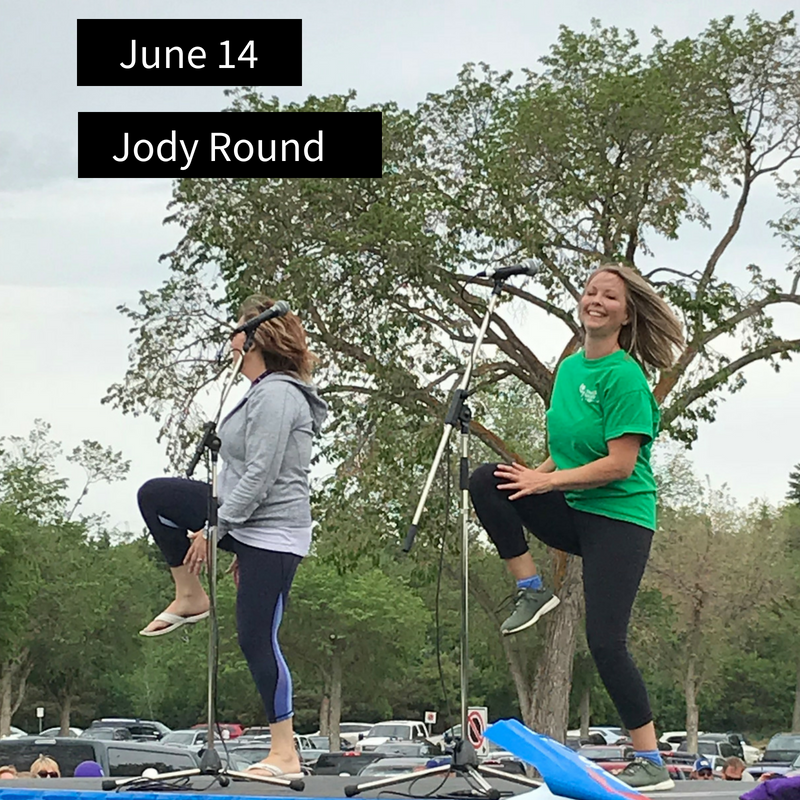 On day 14 of ALS Awareness Month we wanted to take the opportunity to feature one of our Edmonton WALK for ALS Committee members, Jody Round. Some of you might recognize Jody from the Edmonton WALK during the warm up but Jody has actually been volunteering with the ALS Society of Alberta for several years now. Prior to her work with the Edmonton WALK for ALS, she was responsible for coordinating the Barrhead WALK for ALS for many years. Not only was Jody responsible for pumping everyone up at the warm up for the WALK, she was also in charge of the VIP Table, parking, helped with the BBQ and numerous other tasks leading up to the WALK and the day of. Jody has been an incredible addition to the WALK Committee and has been such an integral part of #MakingItPossible for both clients and families to have a memorable time at the WALK. Thank you Jody for all that you do on our WALK Committee and continuing to make such a huge impact in the lives of people living with and affected with ALS. We continue with ALS Awareness Month with Rick Meston's #MakingItPossible story and becoming the Drayton Valley WALK Ambassador. "I started showing signs of a medical problem early in 2016 but they became more serious by December of 2016. Over the next few months I went through many medical tests until November of 2017 when I was diagnosed with ALS by the neurologist at the ALS Clinic at the U of A campus. At the time I had no knowledge of the condition and didn’t comprehend what my doctor meant when he said it was the worst diagnosis I could get. As the condition has progressed with the destruction of all the muscles in my body, the loss of use of limbs and hands and the ability to breathe and the inevitable conclusion, I now know what he meant. I must admit when the ALS Society approached me about being an Ambassador for their WALK, I was somewhat reluctant to have my situation out in the public. But I thought about all the support the ALS Clinic and Society offers and decided I should. The ALS Society through fund raising events like the ALS Walk supplies many things to make life better for ALS sufferers. Mobility aids like walkers, wheelchairs, porch and stair lifts, breathing devices and psychological help as well as funds for research that will someday hopefully find a cure for this terrible disease. The love and support of my family and friends and the tremendous support of the ALS Clinic and Society helps me make the best of each day I have left. Thank you Rick for sharing your story with us. The Drayton Valley WALK for ALS will be taking place this Saturday, June 16th. Today is day 11 of ALS Awareness Month, and we are sharing the story of Andrew Debogorski, and how he is #MakingitPossible to celebrate life's greatest milestones, including his beautiful wedding that took place in April. “On April 28, 2018, around 10 months after Andrew’s diagnosis, we married each other in the most beautiful church ceremony, in front of our dearest loved ones and supportive members of the community. The ceremony was incredibly uplifting and though we were surrounded by others, Andrew and I felt intimate with each other in this moment with God. Following the ceremony was the reception, made entirely possible only by family and friends who completely planned the event from start to finish, making it a smashing success and everyone had an amazing time! It was no small event, with a guest list of 100 adults and around 30 children, and a massive potluck feast and sports bar turned into elegant reception venue! At the very end of the night, Andrew and I had a beautiful few hours together in our home and didn’t get to bed until almost 5am! This moment is one I will always hold in my heart and I thank God for every day. Andrew said the entire day had been like a “fairytale,” and continuously went on about how much he had enjoyed it. It’s only through the love and devoted support of our family, friends, and community, that we were able to make this day happen. Today is day nine of ALS Awareness Month, and we are celebrating the 18th Annual Edmonton WALK for ALS. Today we will honour and celebrate the life of our Edmonton WALK for ALS Ambassador, Adam Rombough and his incredible contribution to the ALS cause. Again, Adam's "A-Bomb" team broke fundraising records and inspired the community to come together to channel hope for a future without this disease. "My name is Adam Rombough and I am honoured to be the 2018 Edmonton WALK for ALS Ambassador. I have always approached life with passion and determination no matter what challenges I am faced with. In October of 2016 I was out for lunch with a client who asked me how long I have been waiting and how many drinks I had already had, because my speech was slurred. The answer was zero; this was one of the many symptoms that I had been experiencing. When I asked my family doctor he did not seem concerned, he brushed me off. After months of pursuing answers from other doctors, in February of 2017 at 32 years old I was diagnosed with ALS, a disease that is always fatal and has no cure. Because of these facts I chose to accept my diagnosis, rather than sitting around feeling sorry for myself. I embraced opportunities that were being presented to me. Within one week I had retired from my career, and then I started living my life the way I wanted to. I began by traveling and started working on a documentary about my life with ALS. I also spend a lot of time developing the relationships that I value the most, because I have realized that that is the most important thing in my life. Even though I choose to look at the positive things in my life everyday there are countless obstacles that I must face: relocating, renovating a house to fit all of the needs of being in a wheelchair, scheduling endless medical appointments, and purchasing and finding the right equipment to best suit my ever-changing needs. All while losing my ability to speak and take care of myself. It has been overwhelming to say the least. Throughout my journey I have realized we are not lacking loving and caring professionals who are willing to do what it takes to make my life easier and more comfortable. What we are lacking is funding and research which is why I am humbly asking you to get on board with supporting the ALS Society of Alberta. The work that they do and the research that they fund has allowed me to focus on living my life to the fullest. I like to believe that I am not slowly dying, but I am quickly living". Today we are featuring Glen Jarbeau and his wonderful commitment to celebrating life and seizing every opportunity. Glen has been an exceptional advocate for the ALS Society of Alberta, attending the legislature to advocate for the best possible care and participating in media interviews. Just yesterday, Glen was interviewed by CBC Radio Active Edmonton to talk about his journey with ALS. Click here to listen. Read Glen's story below, specifically about how he succeeding in #MakingitPossible to attend his brother's wedding! "Three months ago I told my brother and sister in law I didn't think I would make it to the wedding, but my spirit is strong....and I got there! A big team of people made it possible for me to have the equipment needed to attend my brothers wedding in Calgary. I cried like a baby at the wedding and made everyone else cry too. Being with the people I love is kind of like a long goodbye or a long farewell. I have received excellent care from the whole medical profession and with the support of the ALS Society I'm able to stay at home to spend more time with friends and family. Although ALS is a relatively rare disease the needs of ALS patients are shared by many others. Most of us or those closest to us will need Homecare at some point in our lives. I appreciate the recent investment the government has put into Homecare and recently I met with Associate Minister Brandy Payne and thanked her for the great care and ensued a friendly challenge for her and her staff to spend a day every year with a patient!" Today we are celebrating Maria Dixon and her dedication to #MakingitPossible in raising funds for the Edmonton WALK for ALS! She has already raised nearly $900 for this cause. Read her story below. "I first began seeing odd symptoms, it began with slurring of my speech and I began losing the use of my right hand and arm. That was July 2016. The beginnings started with many trips to Edmonton to see Neurologists. Still with no diagnosis I went on the internet to find out where my symptoms fit. After going to medical appointments for five months I asked if it was ALS. They were surprised by my question! Therefore it was January 2017 that I was given a definite diagnosis. That's when my world turned upside down. There was no support system in my home town of Grimshaw to help me. So I made up my mind to move to Edmonton where I had a support system and was determined to make the best of it. It is very hard not to have family close by because it limits me for going out. I am determined to live the rest of my life to the fullest despite many challenges. Together with friends and family and support staff from the ALS Society and the Norwood Extended Care gives me the courage and hope to continue my journey living with ALS. Thank you all for supporting and sponsoring my ALS WALK on June 9th!" Today we are sharing the story of Rocky Leer, who is #MakingitPossible with his family and friends to live each day with hope and optimism. Read his story below! "Hello my name is rocky and this is our story. I say our story because thank God I'm not going through this alone. I was blessed into a large caring family great friends and have made some wonderful new friends that support each other in our individual journeys. February of 2016 is where things started. Like a lot of people that year, layoffs caught up with me and I was out of a job at 52 years old and within a month I developed a slight limp on my right leg. At first I wasn’t worried at all; I hadn’t gone more than three weeks without working my entire life and chalked the limp up to falling on some ice walking the dog. But the limp just got worse and at 52 finding a job was far harder than I ever experienced, and five years prior I went back to school and became a drilling fluids engineer. Going back to school and then my father getting sick with a respiratory illness where he was in foothills ICU for two months had already put us in debt so we sold our house before we lost all equity. Getting back to the limp it wasn’t going away so much for the slipping on ice theory. I went to our doctor in Red Deer, he seemed to think it was a old injury to my back but put me on a waiting list to see a neurologist. At the same time we decided to make the move to Medicine Hat, something we had thought of doing for awhile because our oldest son lived there with our daughter in law and two of our three Grandkids and after all it sounded like I was going to be fixed with an operation. Things were starting to pick up as I was contacted by my former employer and told to stay in touch things we’re looking up. But that optimism didn’t last long, I needed a cane to walk I began to fall down and my arms were starting to get so weak I couldn’t pick up my Grandkids. Finally my doctor in Medicine Hat realized this was no back injury. It was over a year since I was put on the waiting list to see a neurologist still no reply now I was being fast tracked. I had checked my symptoms online and ALS was the first thing that came up but I wasn’t experiencing any problems breathing or swallowing so I dismissed it or more accurately wanted to dismiss it I was convinced I had MS.
Like I said I was fast tracked now to do an MRI and see a neurologist and within 20 minutes I was diagnosed with ALS. It was like the world was pulled out from under my feet. When you’re told you will be in a wheelchair and your average life expectancy is 3-5 years it feels deflating and watching the ripple effect on friends and family is heartbreaking as I said we had recently had to watch our father, grandfather and great grandfather go through his terminal illness and my family did not need this at all. The diagnosis was devastating but for the first time in two years we knew what we were finally dealing with and as crazy as it sounds it was a relief. I hadn’t been able to work now for two years and my EI was done we lost one of our vehicles and had to apply for government assistance. Now here’s my favourite part of the story, remember the friends and family I was bragging up at the start this is where they come in. The only good thing that came from this whole ordeal was the overwhelming love and support from my friends and family and to say the people at the ALS Society are great is a gross understatement I’m so glad to have them in my corner. And having served in the military, acknowledgment to my military family who without them I wouldn’t have known Canada is the only country in the world who recognizes the link between service and ALS. And the Royal Canadian Legion who also stepped up now we are working together to help reach other veterans with this disease. Because of all these wonderful people I can enjoy the time I have and have a greater purpose and watch my grandkids grow up. The picture I’ve shared is from the night we were guests of Michael Backlund to a Kings vs Flames game it was the best night we had had in forever. All of us are die-hard fans and it was my Grandson and daughter-in-laws first NHL game I’m planning on taking my other two Grandkids to their first game next season. I’m not sure how to end this except with what I say to fellow ALS warriors and what they say to me and that’s one day at a time and hope, there’s always that." Today is the fifth day of ALS Awareness Month, and we are celebrating Danny Getzlaf and his amazing contributions to awareness and fundraising in Morinville and beyond. Danny has been hosting a number of initiatives in support of the Edmonton WALK for ALS, including button sales, BBQs, raffles, silent auctions, media interviews, meat draws and more. This past weekend, Danny and his community raised over $11,500! The support that Danny has garnered in his community has made such a significant impact for the Society, and has raised a tremendous amount of awareness. Danny has even coordinated buses to transport folks from Morinville to the Edmonton WALK for ALS on Saturday! Danny has been #MakingitPossible for his team to reach its fundraising goal $30,000, which will greatly aid in the Society's mission of making each day the best possible day for people living with and affected by ALS. Thank you Danny for all that you do for this community! To read more about his fundraisers, click here.